Camp North Woods is an overnight camp for youth to learn lifelong outdoor skills as well as the importance of sustaining Maine’s natural resources. Camp North Woods is hosted by the University of Maine 4-H Camp and Learning Center at Bryant Pond. 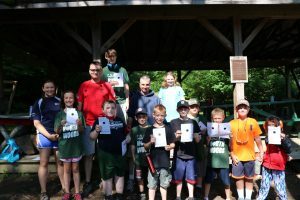 Campers receive instruction from and are mentored by staff from the Maine Department of Inland Fisheries and wildlife and staff from Bryant Pond. The week is filled with hands-on experiences in rifle, shotgun, archery, map and compass, outdoor survival, canoe and kayak, boating safety, ATV safety*, deer and turkey hunting, trapping, open water fishing, fly tying, fly casting and more! *All campers complete an ATV safety course where they will earn their ATV certification during their week at camp. Because there are a limited number of spaces at camp North Woods, a chance lottery is held by the Dept. of Inland Fisheries each spring. To see more summer camp options at the University of Maine 4-H Camp & Learning Center at Bryant Pond, visit: Summer Camp programs.